Proxy is a plug-in that can be used to substitute low-res proxies for a hi-res source model at render time. You can either provide your own proxy model, or, far more conveniently, the plug-in can make it for you. 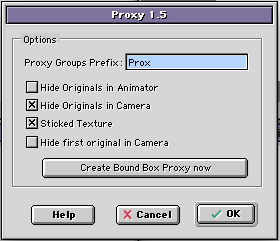 Once your proxy is created, you prefix it to let the plug-in know which groups are proxies. You can then stamp the proxy around your scene, rotating, scaling and animating to taste. When you render your scene, the proxies will be replaced by your original hi-res model auto-magically.